Climbing Flax is a rambling, climbing scrub with yellow velvet-hairy twigs. Branchlets are horizontal, provided with a pair of strong circinate hooks. Leaves are simple, alternate, elliptic-obovate hairless and penninerved. 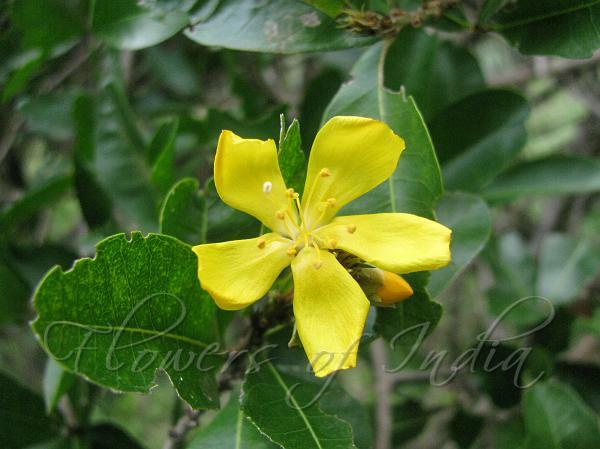 Flowers are yellow,	about 2.5 cm across, borne at the ends of the branchlets, on short stalks, clothed with soft yellow hairs. Petals are many times longer than the sepals. Fruits are globose fleshy drupes, seeds 2 or 3 compressed. Climbing Flax is found in Peninsular India and Sri Lanka. Medicinal uses: The roots are astringent, bitter, sweet, febrifuge and anthelmintic. They are useful in fever, verminosis and vitiated conditions of vata, externally as a past for inflammations and used swelling due to viper bite. Identification credit: M. Saradha Photographed in Palamai Hills, Coimbatore, Tamilnadu.